Build your Customer base fast, by promoting your new Small Business quick and easy! Money spent on Advertising is deductible as a Business expense. But, you can't spend it if you don't have it. I'll show you how to get it done without breaking the budget. The nature and purpose of your small business will determine which of these steps works for you. 1. Create your own, or buy customized Business Cards. Worth mentioning first, since small business marketing relies heavily on Business Cards. You can find dozens of companies online which would gladly print up a bulk order of Business Cards. Vista Print, for example, even has FREE Business Cards (among other great giveaways). You could go to your local Office Supply Store to have 1000 Business Cards made for just under $0.05 each. Or you could design them yourself, using a Microsoft Template in Word. The most expensive option, but the fastest by far! Keep the cost low, by sticking to one or two colors. Never pass up a good opportunity to exchange Business Cards! 2. Get a Business phone number. Having a number in the Yellow Pages will get you more business than you might imagine. And, a simple line listing usually comes free with every number. Include your Business number on your cards. 3. Create a Website. Just about everyone has a Website, these days! Easy to set up, even for a novice. You can start one up for free, saving your money until you get the ball rolling. Weebly, for example, allows you to purchase a domain name from somewhere else and host it on their site for free. Dream Host has domain names available for as low as $9.95 per year. Plan ahead so that the company you sign with for free will be the one you pay for later. That way, people who have bookmarked your site won't find a dead link if your site changes servers. If it does, be sure to create a 301 redirect. While I'm at it, get an e-mail address in you business name with the company you choose to host your website. Once you have a website, don't forget to submit the address to Google, Bing and Yahoo! search engines. Include your web address on your Business Card. 4. Make your own signage. You can buy peel-n-stick vinyl lettering and advertise on your vehicle(s), your store front windows or on a movable site sign or yard sign. Buy a kit and make a magnetic sign. If you know someone in Real-estate, the signs they use are the perfect size to stick in a customer's yard to advertise your work. 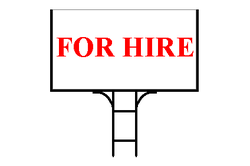 Online companies such as Sign*A*Rama & Sign Depot can produce cheap signs in bulk, for about $1 a piece. The best time for a site sign is while the job is being performed. Leave it up for a day or two afterward so people can see the finished results. Don't spend too much on signs though, since the competition might come along and steal them. Ordinances regulate signage. These include permits, size of the sign & lettering, placement and information displayed such as Company Name, Phone Number, DOT#, Certifications, Licenses, Membership & Association #'s. Regulations vary from City to City. Contact your local Planning & Zoning Department for specifics. 5. Avoid methods which you yourself have found annoying in the past. Many of the following methods go beyond the average start-up budget for most Small Businesses. A. Fliers. Violating someone's space and privacy is not a good way to start a Business relationship! B. Marriage Mail. This is the name the USPS uses when referring to the bulk advertisements and fliers they distribute along with our first-class mail. Minimal return. C. Mass email marketing. The cost to your reputation may exceed the price of purchasing address lists. Most will not make it passed a spam filter. Those that do will likely get deleted. 6. Give Google AdWords a try. The Google AdWords Team will work with you to set up an advertising campaign, complete with targeted keywords pertaining to your type of business, set your maximum CPC and the duration of your campaign. Of course, you have complete control of all options and can alter them at any time. * Take a walk through your community this weekend, with clipboard and Business Cards in hand. * When you see a property in need of your services, knock on the door. * Be polite and courteous even if they aren't. * Do not be overly aggressive or disrespectful when discussing the problems you are proposing to fix. * Offer free estimates and a free limited warranty. * Look and act like a professional at all times. You are not only selling your services you are selling yourself. * Leave each new acquaintance with a smile, a firm handshake and a Business Card. * If your Business has a seasonal aspect to it, consider sending inexpensive reminders in the form of Postcards. Add 'Pass it on' and your Customers are liable to advertise for you. * Word of mouth is the best advertisement; so give them something good to say! * When you get a referral, don't forget to thank the Customer for it! * Open a Business Checking Account in the name of your Company, to make it easier for your customers to pay you. * Get a low APR Business Credit Card associated with the account. * Make all your Business purchases through this account and keep all receipts for Tax purposes. * It is a Federal Offense to put anything in someone's mailbox, unless you are an on-duty member of the USPS. * If it looks like you spent a lot of money on advertising, people will assume that you over charge for services. It is a catch 22.